As of Q1 2011 release, developers are be able to load skins from an external assembly. In this article, we will describe the steps for creating a custom Skins Assembly. Registering custom skins by path can also be done through RadSkinManager - Load skins by specifying a path. For the documentation we will be using RadSlider control and creating our custom Skins Assembly from the custom skin files generated by Visual Stylebuilder (Classic rendering) and Sass ThemeBuilder (Lightweight rendering). More information on how to create a custom skin is available in the Controlling Visual Appearance section in the documentation. Below you will find step-by-step instructions that will guide you through this process. Create a new class library project and give it a name. We will name it MyAssembly. The namespace must be the same as the assembly name. Create the folder named after the custom skin. Use the skin's name for Classic RenderMode, for example, MySkinName, or append the "Lite" word to the skin's name for Lightweight RenderMode, for example, MySkinNameLite. 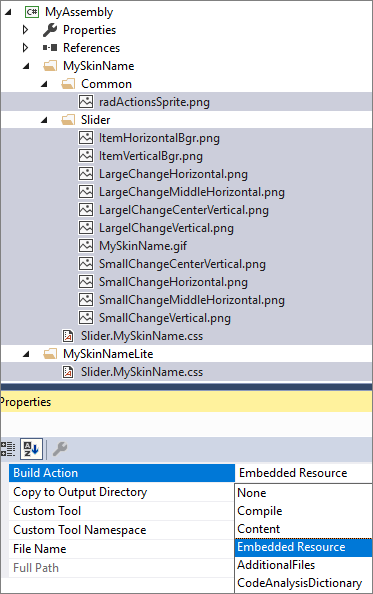 Drop the skin related files in their respective folder and mark them as embedded resources (right click, select Properties and from the Build Action dropdown choose Embedded Resource). You can select multiple files and mark them as embedded resource at once. Because of the specifics of Embedded Resources in an Assembly, the links in the CSS files must be replaced with WebResource URLs. Consider the following URL: url('Common/radActionsSprite.png'). For WebResources, the full path is required, including the namespace separated by dots (.). url('<%=WebResource("NameSpace.Folder.SubFolder.someFile.png")%>'). The above class defines the skin “MySkinName” for the Slider control. Note the third parameter of the attribute – it is very important to set it so the Telerik skin registrar code can know which skin to load for the given control. 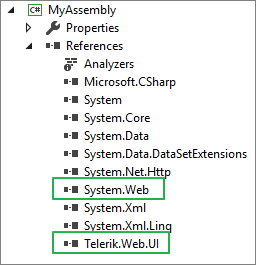 We will now compile our new project to get the custom skins assembly MyAssembly.dll and place it in the bin folder of a Web Site next to the Telerik.Web.UI.dll or in the GAC. If you are using Web Application, you will need to add a reference to it. If skins assembly is in the GAC, you must use its full name. <telerik:RadSlider ID="RadSlider1" runat="server" ItemType="Item" TrackPosition="Center" Height="80" Width="379"
A final note – it is possible to have one of the default skins in a custom assembly – for example you customize the Hay skin and put it in a custom class project by following the steps above. Once you set the Telerik.Web.SkinsAssembly setting in the web.config, the Hay skin will no longer be loaded from Telerik.Web.UI even if it is present there as well.